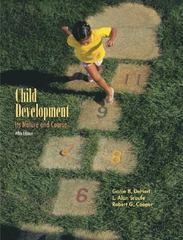 Child Development 5 Edition This cutting-edge textbook for a chronologically organized course provides a captivating introduction to the study of child development - its theories, its themes, and its contexts. The fifth edition features the most current research and theoretical findings available and includes the trademark vignettes about three children whom students follow throughout the text. The text offers emphasis on diversity, a balance between research and applications, and coverage of the latest developments within the discipline. This new edition also features observational exercises at the end of each chapter.